Guide 6: Job Hazards: Who’s At Fault? 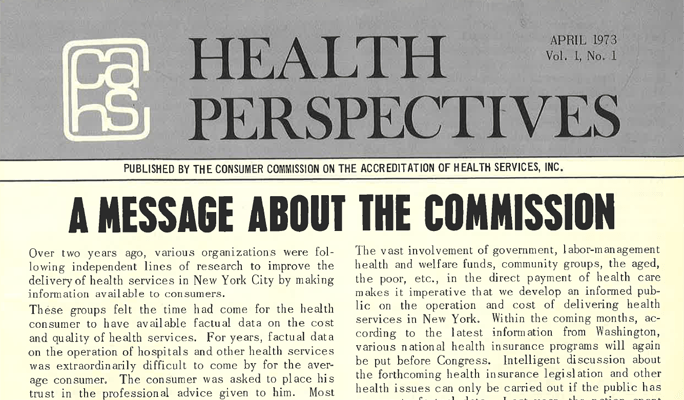 A brief history of the development of CCAHS introduces the Commission’s purpose to gather and distribute information about hospital and medical services in New York and the country. The impetus stated was the stunning effect of “catastrophic cost of hospital and medical care.” on Americans. To meet its objectives the CCAHS would collect information, evaluate services, accredit hospitals and other services and provide other information to assist consumers make decisions about the care they receive. Nothing more grandiose could have been planned. Information gathering was possible and important ground was broken but accreditation of hospitals and other services was a dream. But other new techniques to ensure some level of participation in hospital accreditation were found and implemented. For the most part the consumer movement was an embryo that has not passed the initial stages of gestation. So even with the best of intentions and efforts the consumer movement was at great disadvantage. However to our shock the established interests after their first volleys and threats soon saw the CCAHS’s publications as a source of information which they had been unable to obtain on their own. Many providers and agencies of state soon became subscribers. Vital information collected for the benefit of consumers and consumer organizations had become also a data bank for special interests to advance and advocate their causes. This was evident with the first publication about CCAHS which also included HOSPITAL PROFILE FACT SHEET No. 1. This Fact Sheet had 4.5 pages of profiles about each proprietary hospital in New York City. Each profile gave the name, address and phone number of the hospital, the names of the owners or corporate officers, the name and title of the chief administrator, the number of beds by type of clinical services, and the daily reimbursement of Blue Cross, Medicaid and Workmen’s Compensation. The publications use the terminology current on the date of publication and often uses the masculine pronoun. Proprietary anger was not about what today would be perceived as a need to become politically correct but to the specific disclosures made. Today disclosure is stated as transparency a term that obfuscates honesty and full disclosure. But in April 1973 the release of the names of partners, corporate officers, and selected hospital reimbursement rates was considered revolutionary. And as in most revolutions those exposed or threatened, in this case the listed owners of proprietary hospitals, reacted; at first against CCAHS and then against the government agencies where the information was legally gleaned. All the information gathered, analyzed and provided in this and other CCAHS publications was researched under laws that made this information open to the public. This disclosure including the Blue Cross rates which under its agreements with each of its member hospitals was not to be disclosed by either Blue Cross or its member hospitals was made entirely in accordance with State and federal laws and regulations of New York State agencies. The CCAHS refused to buckle under the threats of litigation or worse made by counsel of several hospitals and indirectly by administrators. Realizing the horse was out of the barn, the owners of the hospitals and Blue Cross saw that any litigation against CCAHS would only force more disclosures through discovery. The proprietors then sought relief by attacking and threatening New York State agencies and Blue Cross. The State’s response was simple: it is public information which CCAHS found and published on its own. Blue Cross was able to deny any role in the disclosure of rates and also made efforts to co-opt the CCAHS. As the primary investigator, Edward Gluckmann, a former Blue Cross and HIP employee with a M.S. from Columbia University’s School of Public Health and a B.A. in economics from CCNY had little to say when meeting with a counselor for many for-profit hospitals except: “Sue us. We did nothing wrong.” Donald Rubin, a former labor-management health and welfare administrator and consultant to self-insured benefit programs and founder of what became Multiplan, Inc, the largest and oldest nationwide PPO said: “It is time that consumers have this information. With once confidential and hidden information revealed, the playing field becomes more level for all consumers and payers.” We will never know the full extent of the behind the scenes discomfort and reactions of the owners, corporate officers, Blue Cross and agencies of New York State. We can assume it was not always pleasant as we soon learned with the next publication.